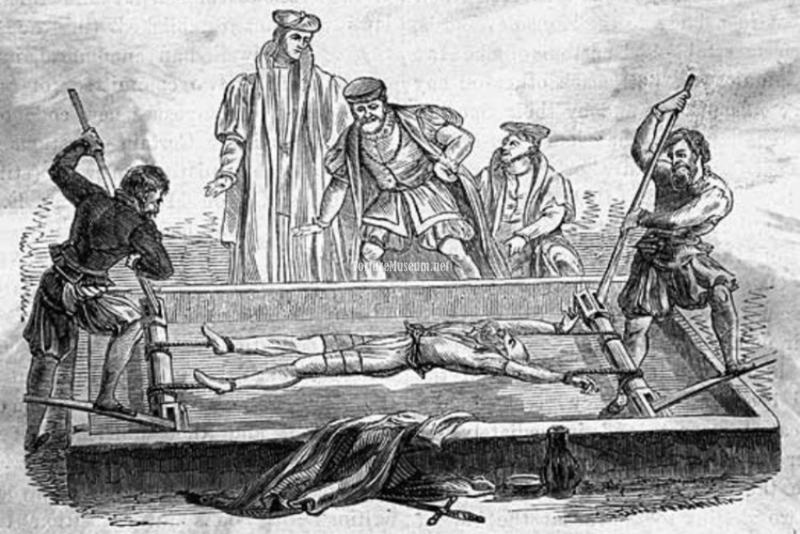 The advent of the rack comes from British Constable John Exeter who invented the device in 1447 for the torture of prisoners of the Tower of London (initially it was called the “Duke of Exeter’s Daughter”. The operating principles of this sinister mechanism centers on the torque that stretches the joints and tears muscle ligaments. The accuracy and ease of the rack’s design made it the most commonly-used instrument of torture of its day. 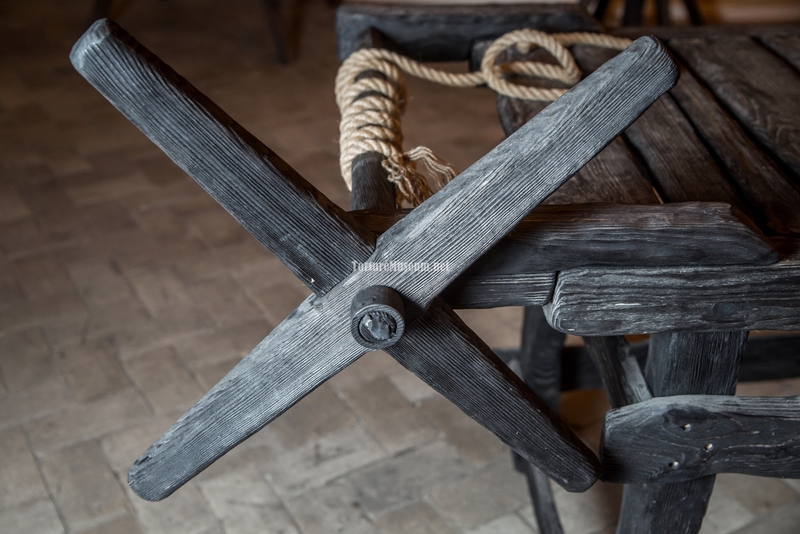 It consisted of a wooden table with rollers at either end to which ropes were tied. 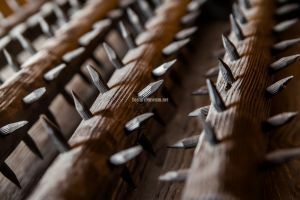 Later on, the French would slightly modify the rack’s appearance, adding an additional mechanism — metal rollers with spikes that sliced into the skin and muscles of the victim’s back. 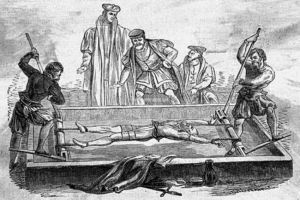 Any criminal or deviant could could be sentenced to torture via the rack. After such a verdict, they were laid on the table, wrists and ankles bound with ropes, and slowly stretched in opposing directions. 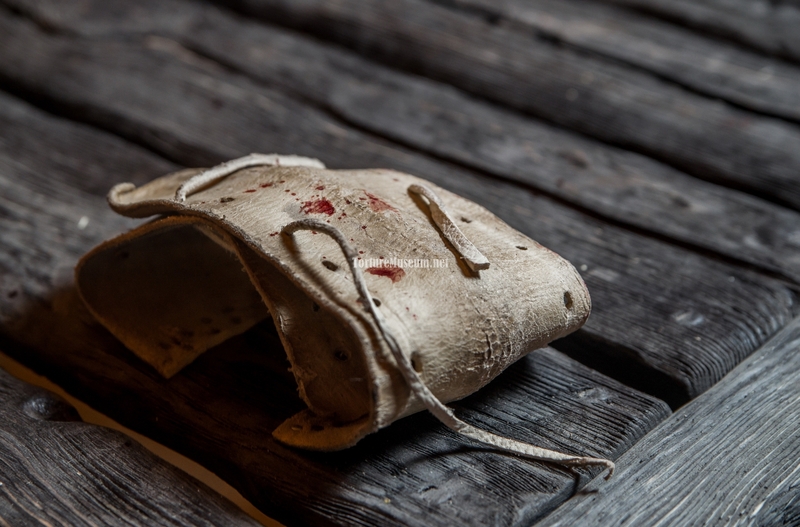 The advantage to this torture method was its extremely precise control over the impact of pain. The tension could be increased, attenuated, and then enhanced by twisting the victim’s joints, and eventually, tearing the muscles and the nerves apart. After a few hours spent on the rack, any man would remain crippled for life. An interesting fact: Originally, ancient Russians called this instrument of punishment the “shoe”, to which the guilty were tied (“placed in the rack”). 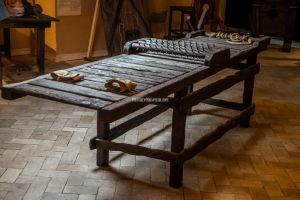 It was first mentioned as a form of punishment at the beginning of the XIII century in the contract between Smolensk and Riga (1229), according to which, “if the Rus was deemed guilty, they were not placed in the rack, but merely sent away on bail; if not bail, then cast in irons. So, you’re interested in how the Rack works? I thought that even kids knew about these things! The rack is constructed in the most primitive of ways, which means it is awesome! Make yourself comfortable, this process of investigation can last for hours, even days. At first glance, nothing too frightening. The interviewee lays on a table, his wrists and heels tightly bound by leather straps to which ropes are attached and wound over cylindrical blocks. A bunch of levers are sticking out of the blocks. The assistant to the older inquisitor lightly pushes the levers down and the blocks rotate, tension in the ropes tightens, the belts dig into the skin, and the body of the prisoner is stretched outwards. All of this takes place slowly, the slower — the more torturous. In the beginning, it might even be invigorating — like a good morning stretch. Distances between vertebrae expand, joints are warmed up, muscles and tendons acquire a healthier tone…. posture is corrected in such a manner that causes aching pain, and though one may want to return their body to its prior positioning, it is merely not possible. Prisoners who are especially tough are placed on spike rollers that churn and tear at the flesh of their backs. The block gives a click and rotates every so slightly, and the prisoner being acquainted with this device feels pain throughout his shoulder joints and waist. His ribs are beginning to put pressure on this lungs, stealing his breath away. He attempts to conserve his air, but nevertheless, sorrowful moans are pulled from his parched mouth. In a few hours he will be allowed to drink, however, by the time this happens the stress in his shoulder joints are shattering his tendons, or breaking his bones, and exposing his nerve endings. In the mind of the one standing trial flows an unbearable pain. But he has no choice. He will have to tolerate it. What would you do if confronted with such a paradox?